Earlier this year I traveled to Meherpur, accompanied by other senior specialists and managers of School Health Nutrition. The purpose of our travel was to observe our new Community Based Health Education sessions, and to visit some primary schools in Meherpur Sadar and the Gangni sub-districts. We first met with Head Teachers and School Management Committee members. 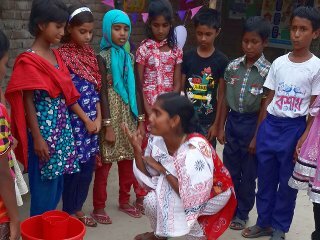 We observed classroom-based health education sessions and demonstrations of hand washing at the hand washing corner in the schools. The children participated in the health education class very attentively and enthusiastically. To increase attendance rates through ensuring good health, additional teacher-led health education sessions are being implemented at primary schools according to individual class routine, along with weekly sessions included in physical education for all grades. To answer the need for more education sessions on water, sanitation, and hygiene on a community level, the sponsorship program has started a new Community Based Health Education (CBHE) initiative in the Sadar sub-district in Meherpur. The objective of this new initiative is to increase the knowledge and skill of children ages 5 through 12 regarding water, sanitation, and hygiene through community based education sessions. Groups consist of 12 to 15 primary school age children, and are facilitated by 2 of the older students, 10 to 12 years old, from the community. The CBHE session we participated in was very enjoyable and interactive. The facilitators always aim to include innovative methods in each session. How do you think we can help emphasize the importance of water safety, sanitation, and hygiene to primary school age children? Sponsorship program staff always aim to make learning fun, please share your ideas with us!